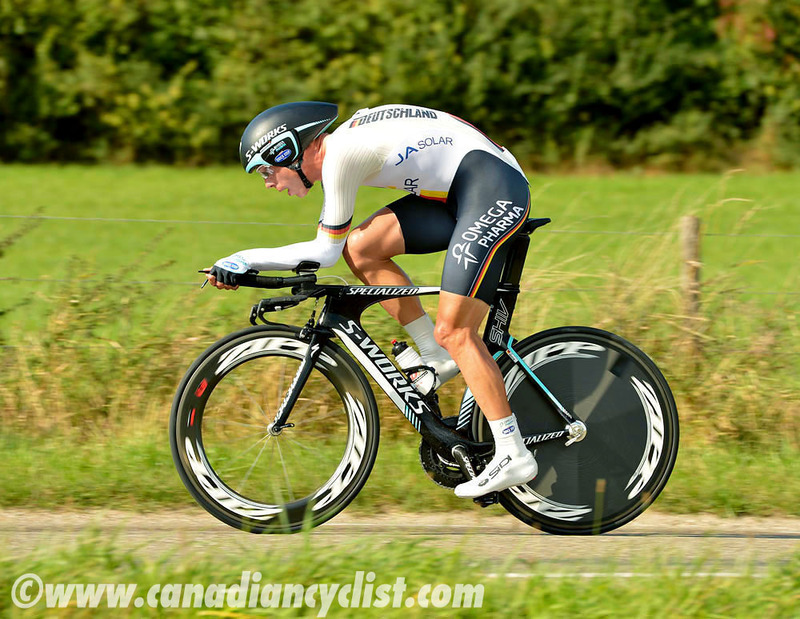 The time trial portion of the 2012 Road Worlds concluded on Wednesday with the Elite men's 45.7 kilometre competition, where Tony Martin joined German compatriot Judith Arndt by successfully defending his title. His margin of victory was a slim 5.37 seconds over Taylor Phinney (USA). 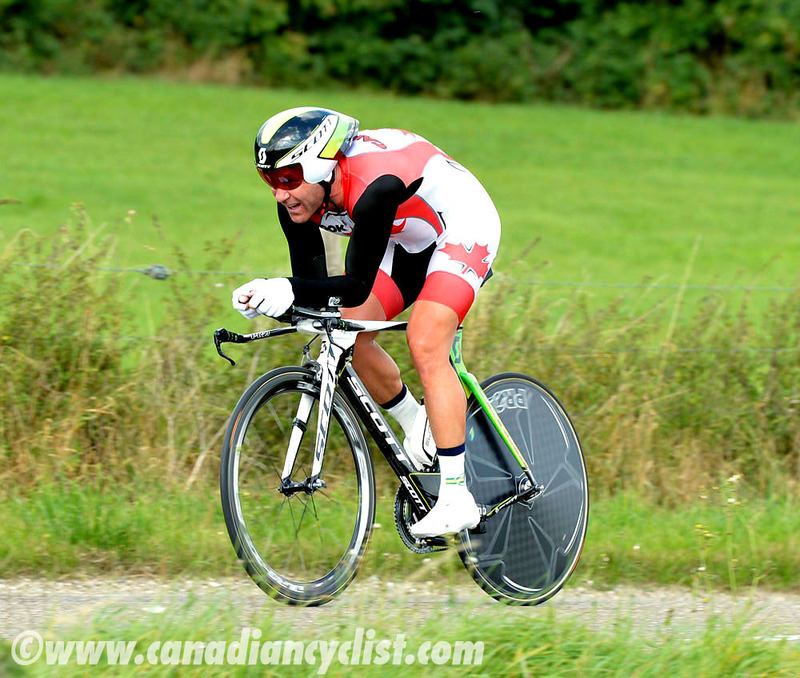 Canada's lone entry, Svein Tuft finished 12th, 15.7 seconds out of the top-10. The men's race started in the town of Heerlen, north and east of Valkenburg, and incorporated sections of the Team Time Trial course from last Sunday (Martin was a member of the Omega Pharma - Quickstep squad). In addition to three climbs (including the final ascent of the Cauberg, 1.5 kilometres from the finish line), the riders had to contend with narrow, twisty roads, sharp corners and roundabouts, and the weather. Starting sunny but a cool 14 Celcius, gusty winds took the temperature down further, and a sudden rain squall dampened the road, forcing further caution. One rider was seriously affected: Marco Pinotti (Italy) was in contention for a medal with less than 15 kilometres to go, when he slid out on a wet painted road line, crashing hard and possibly breaking his collarbone. Dmitriy Gruzdev (Kazakhstan) was the early leader, almost breaking the hour barrier with a time of 1:00:35.20 . After starting 19th out of the 58 rider field, he held the Hot Seat until unheralded Vasil Kiryienka (Belarus) knocked 12 seconds off the leading time. Kiryienka would end up spending the rest of the day in the Hot Seat, as rider after rider tried and failed to replace him, eventually winning the bronze medal. As the start order entered the final ten, the gap to Kiryienka was shrinking. Tejay van Garderen (USA) crossed the line 4.5 seconds back, followed by Fredrik Kessiakoff (Sweden) less than six seconds back. But everyone was waiting for the final three riders: Phinney, then Vuelta winner Alberto Contador (Spain) and finally defending champion Martin. 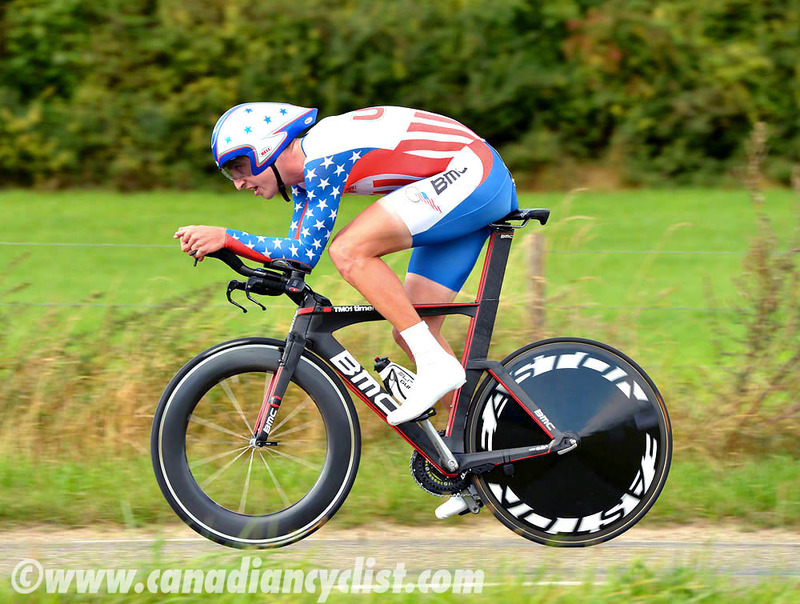 Phinney was ripping up the course, setting fastest times at every split. Contador, by contrast was clearly not having a good day, and was eventually passed by Martin after the second split (29.7 kilometres), ending up ninth. Martin came through the first split (14.3 kilometres) four seconds down on Phinney, but then started to take control, moving 13 seconds ahead at the second split. The German rider, churning a 58 tooth chainring, started to lose some of that margin over the remaining 16 kilometres, ceding five seconds over the next eight kilometres and another three over the final eight, but held on to take the title. 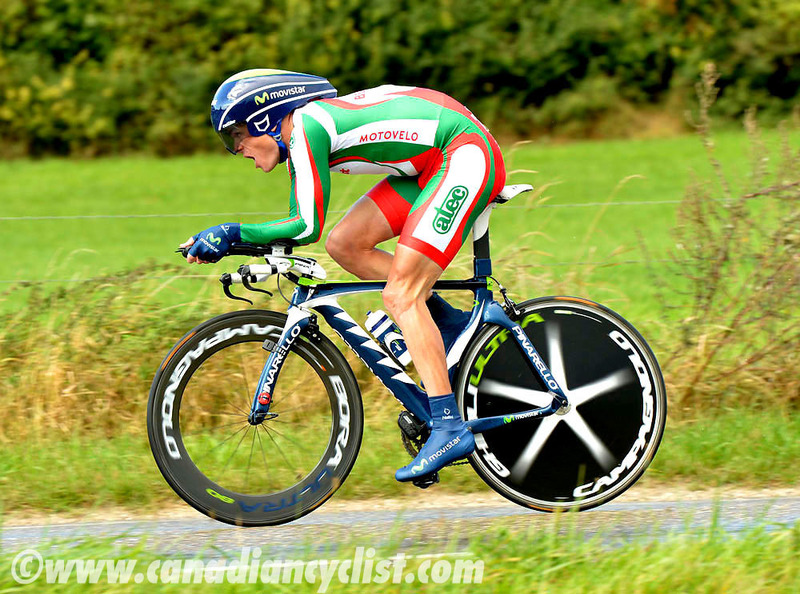 Martin and Phinney were the only two riders to crack one hour. "There was a lot of pressure on me to win again," Martin said. "I said I just have to ride, but it was not so easy to win. Sometimes you have the power in your legs and sometimes you do not for a race like the World Championship that is just one day. I happened to have good legs. This course was harder than I expected, but I did my best to win for the team despite such a hard final. I had nothing left at the end. I also have to give credit to Taylor, who rode the perfect race today. I am so happy for my victory and to be World Champion again."